Be on the lookout for Dooley, Emory’s unofficial mascot, as Dooley’s Week takes over campus April 9-14 with a full slate of music-themed “Dooleypalooza” activities. Dooley’s Week is April 9-14 this year and the Student Programming Council (SPC) is urging students to “get pumped up” for Emory's biggest spirit week of the year. The campus tradition honors the university's unofficial mascot. 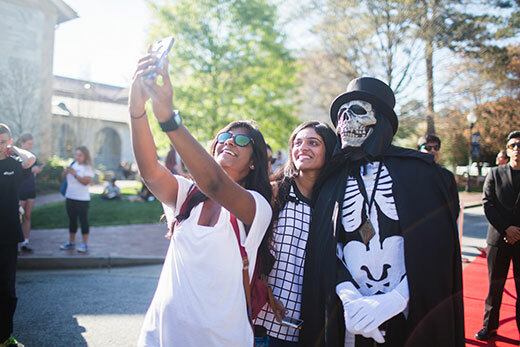 Claire E. Dooley — by tradition, the silent skeleton takes on the first name and middle initial of Emory's current president — and her entourage will appear throughout the week to join in the fun, including possibly dropping in to dismiss classes of a few lucky students. This year’s theme is “Dooleypalooza.” Events each day of Dooley’s Week will be inspired by favorite genres of music and feature themed activities and food, says Tamara Ezzat, SPC president. The headliner for the main concert is Atlanta-based hip hop artist Lil Yachty, who will perform his self-described “bubblegum trap” on Saturday, April 14, at McDonough Field. Doors open at 8 p.m. The concert is free for Emory undergraduate students; however, guests (who can attend with an Emory student) will be charged a non-refundable fee of $10. The fee will help cover concert fees, including the artist, production, EMS, security and other expenses. It is also designed to encourage students to only register guests that they are certain will attend the concert. Guest registration for the Lil Yachty concert is currently open. Monday, April 9: Dooleypalooza kickoff event features an interactive DJ game and festival food. Tuesday, April 10: The annual Taste of Emory event offers free samples from restaurants around Atlanta on McDonough Field. Wednesday, April 11: A noon event, Wild West Wednesday, will be country-music themed, including a petting zoo and state fair activities. SPC will sponsor Wonderful Wednesday After Dark, providing festival food and giveaways starting at 6 p.m. A number of other campus organizations will also participate. Both are held in Asbury Circle. Thursday, April 12: Enjoy a Throwback Thursday theme with tie-dye, dance revolution and a photo booth. A comedian will perform in Glenn Memorial Auditorium. Doors open at 7:30 p.m. The comedian has not yet been announced, but “stay tuned!” Ezzat says. Friday, April 13: The International Festival and World Cup will be at McDonough Field at 6 p.m. featuring information and displays from a variety of international organizations and a student soccer competition. At 9 p.m., “Dooley’s Fete: The Glow Party” will be held at the Campus Life Pavilion. Saturday, April 14: The Greek Block Party on Sorority Lawn will take place at 4 p.m. and the First-Year Dinner at 6 p.m. on the Wagner First Year Quad. These two events happen before the Dooleypalooza main concert at 8 p.m. on McDonough Field. Ezzat lists these other organizations participating in Dooley’s Week by offering activities and events: Resident Hall Association, EPC, Interfraternity Council, SAC, College Council, GSGA, EE&VM, Campus Kitchens, Emory Slow Food and ISLAB.